Weather : -1c Start clearing skies later max 6c, No wind. Me and brother Neil are loading the boat in a nice White frost this morning and extra care is needed with the mooring very slippery. We had planned on catching a few live baits before leaving but that was put on hold as its normally a long process when the water is this cold. We decide to try for some at our first swim. We leave the mooring in the dark with full navigation lights on and set off through the freezing mist. Its actually light enough to see our way down the river with no lights on as its a big full moon. The journey goes quickly and we are soon tying up near the Playhouse swim. Fish are topping everywhere so as soon as we both have Two dead baits out i set up a bomb rod to catch some bait fish. I reach for the bait box but as i open it, realise Ive made a schoolboy error. The bait box with the nice Red maggots in is obviously still at home on the garage floor ! Dead baits it is then. I convince both Neil and myself that the dead baits will be better anyway in the coloured river. Our baits have been in since 7am and its just about 7:30 when my half Mackerel tail float quivers, stands up and slides off. A lift into what feels like a fairly small fish and soon hand out a 3-4lb Jack. We then fish until 9am without any further activity so we make a move to a swim around 200 mts upstream in the shaddows of Coslany Bridge. 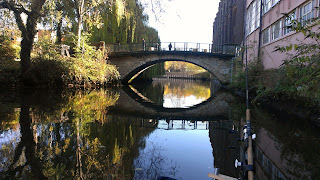 This is almost as far as you can travel upstream without fishing in New Mills Yard and we tie up on the far bank in the deepest water. We position our baits in all the likely looking spots, bottom of the shelf, far shelf and front and back margins on our side of the river. The river narrows up here and we have trouble holding our baits in the much heavier flow. We end up having to the two far side baits up on the top of the shelf and lift all the braid off the water. This works a treat, but the Pike were having none of it. Lots more rubbish is being pushed through here too so after about 40 minutes we move again. This time we moor up just past the playhouse at another bridge, Blackfriars. The rods are soon out again and we settle down with a nice hot drink. Neil's ledgered Smelt is soon picked up and an identical Pike-let to the one i had earlier is boated and released. It seems like its another false start here, no more interest in the following 90 minutes. Its worth fishing this swim just for the view. With the skies clearing as forecast we decide on one last move to the turning basin area where will we will have our lunch and fish out the rest of the day. 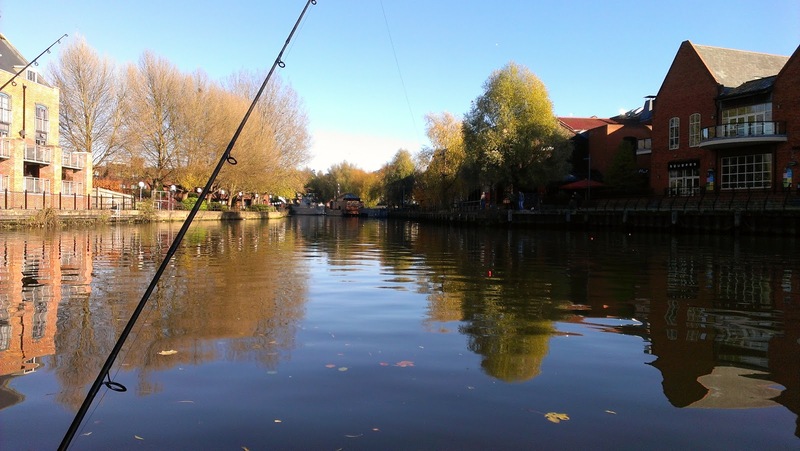 As we arrive in the basin there are at least five or six anglers fishing from the bank outside all the riverside pubs and restaurants. 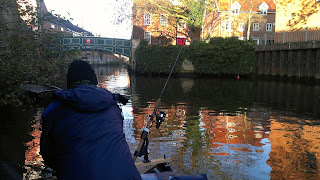 We moor up as far away from them as we can, on the far bank and quickly get our baits out. Lunch comes and goes, the Sausage sandwiches go down a treat as always. The Pike don't seem to be interested at all today. From where we are moored we can count at least 16 floats, including our 4, scattered all over the basin and not one of them shows any interest at all. You can almost count all the floats in the picture below. With time ticking away and fast approaching 2pm we decide to pack up and head back. Another day that promised so much has ended up being another Sun bathing session! We both agree that we will give the basin a wide berth until the sleet and snow turns up and the bank activity slows up a bit.